I haven’t reviewed a food delivery service in quite a while. I tried Blue Apron years ago (once) and then tried Hello Fresh in 2014 and have been using it once a month or so ever since (2014 Hello Fresh review). Over the last four years, lots and lots of new food delivery service companies have launched. I’ve been pretty happy with the occasional Hello Fresh delivery though, so I never bothered to try any of them. A month or so ago a friend shared that she had some free trials of Home Chef… so I figured, why not? Unfortunately, I waited too long to claim my free trial because I was going out of town, but still decided that I wanted to try it out. Home Chef sent me a $30 off promo, so I went ahead and ordered my first box. 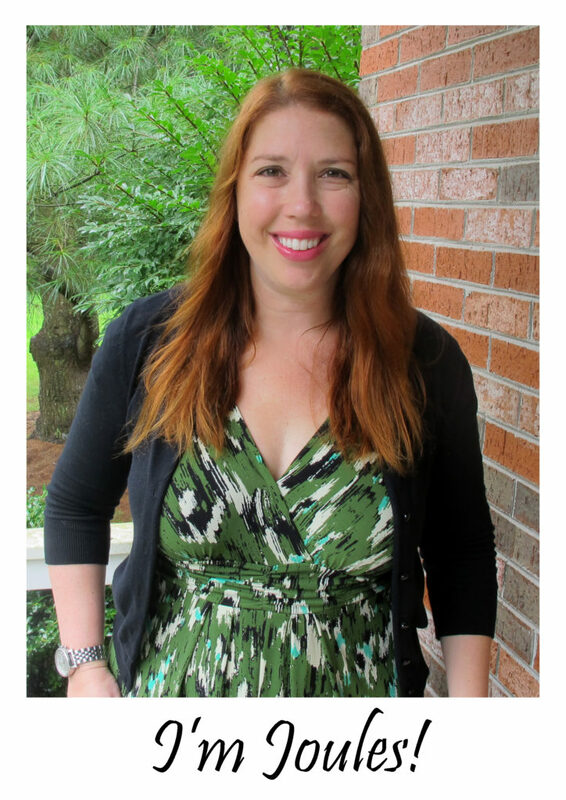 And if I’m going to try it, I might as well share my thoughts with you all! Each week subscribers can choose from 15 recipes featuring steak, chicken, pork, fish or vegetarian meals. I picked the three meal option (2 servings per meal) and it cost $59.70. Each week there is also an option to add a fruit basket and/or smoothie for an additional cost. I didn’t add any of those extras and just stuck with the meals. I had my delivery come on a Tuesday and I received an insulated box that contained a binder with the recipes, as well as all the pre-portioned ingredients clearly divided into the three meals. This was the first meal I made from the box and I really enjoyed the steak and potatoes. The carrots could have used a little longer in the oven. My husband said the steak was not the best I’ve made, but I’m pretty sure that was due to me juggling dinner and lunch packing and not a reflection on Home Chef. And he totally ate it anyways, so he must have liked it a little…. I made this the next day and my husband was out of town, so I totally didn’t have to share. I did send him a photo though so he could see what he was missing! 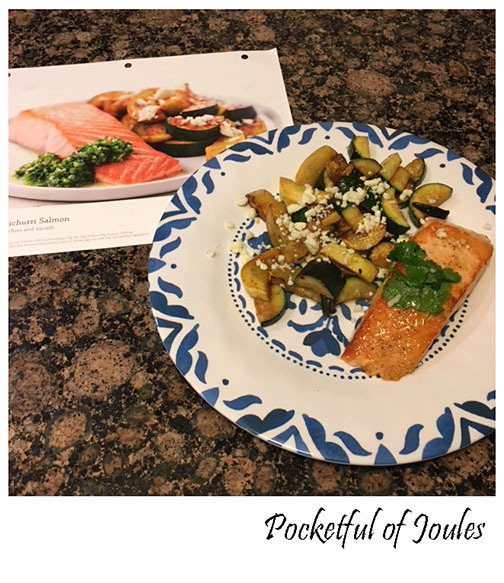 I LOVED the entire meal, including the chimichurri sauce on the salmon and the added cheese on the zucchini/squash combo. I shared some salmon with Jack and ate the second meal the following day for lunch. It was delicious reheated! This recipe was the most involved of the three, but I really liked that the meatloaves were made with ground turkey rather than beef. I’m still limiting my beef intake (darn cholesterol), so I wouldn’t have been able to do this and the steak in the same week if it were red meat. I liked the mini turkey loaves (made in muffin tins), they were really tasty and filling. Jack loved it, but wasn’t a fan of the green peppers… but I can easily customize the recipe and keep it divided in the muffin tins the next time I make it. I really enjoyed all three of the meals and didn’t find any of the instructions difficult to follow. 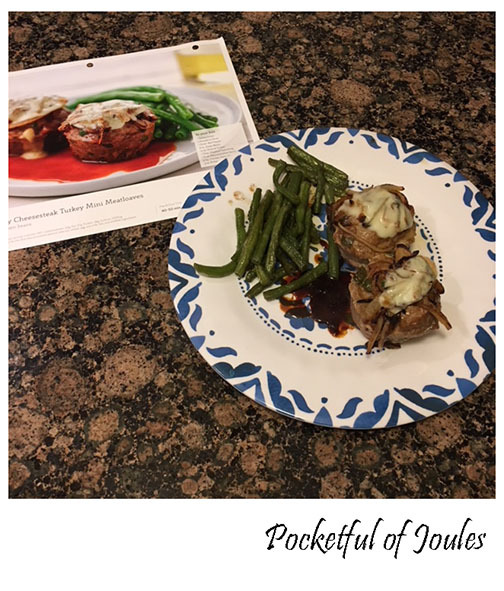 I liked the variety of the meals and how every single ingredient needed was included in the box (even a little pat of butter for the green beans). I would (and will) make all three of these meals again! Since I’ve been using Hello Fresh for the past four years, it only makes sense to compare the two services. Since they are so similar, there can only be ONE WINNER of my heart. Or tummy. Home Chef allows subscribers to pick from 15 meals each week, while Hello Fresh offers 14 meals. I’ve been using Hello Fresh for the past four years (ordering once every 4 – 6 weeks), so I’ve seen lots and lots of repeated meals. Once I make a meal that we love, I keep the recipe so we can remake it on our own… it doesn’t make sense to order the same meal from Hello Fresh to remake. I’ve only used Home Chef for the past month (we’ve received one order and we have one more coming in a couple weeks). I can see all of the upcoming menus for the next 6 weeks and it seems like there is a much wider variety. Winner: It’s looking like Home Chef is the winner, but I’ll keep you posted. Most Home Chef meals are $9.99 a serving, with lunch portions discounted to $7.99 a serving. For Hello Fresh, the 3 meal/2 serving plan is $69 per week which breaks down to $11.50 per meal. Hello Fresh also charges more for ‘gourmet’ recipes – such as Garlic Herb Buttered Sirloin Steak (an extra $5.99 per person). This is actually the reason that I decided to look into Home Chef – Hello Fresh previously did not charge more for certain meals and I find it a turn off, especially when they are already more expensive! 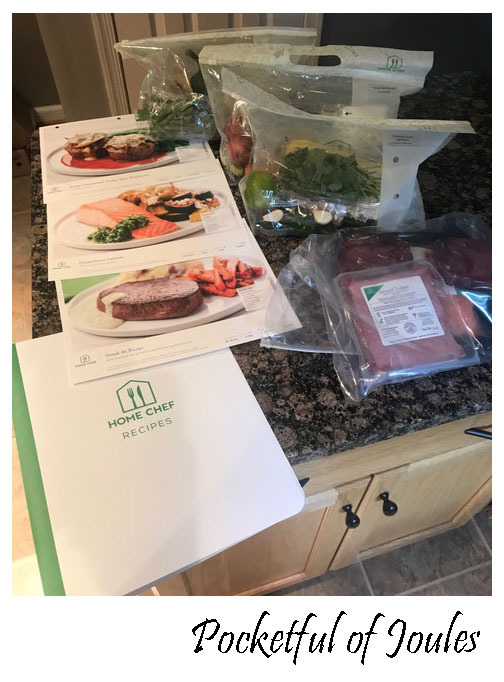 Home Chef sent me a plastic binder that included all three of my recipes for the week as well as some overview information. Hello Fresh sends their recipes out loose. This isn’t a huge deal, just a really nice touch as I can then add additional Home Chef recipes into the binder easily. As for the ease of executing the recipes, the three Home Chef recipes I made worked well. They made sense in how you prepare the ingredients and the suggested timing seemed accurate. Many times when I’m making a Hello Fresh recipe, I have to change it around because there is a more efficient way to do it. For example, if I’m making everything on the burner it doesn’t make sense to turn on the oven to roast some zucchini when I can just sauté it in a pan. Same goes for turning on the oven to toast a piece of bread… HELLO, that’s why we have toasters! One of the reasons I liked Hello Fresh better than Blue Apron was because they offered more generous portion sizes. 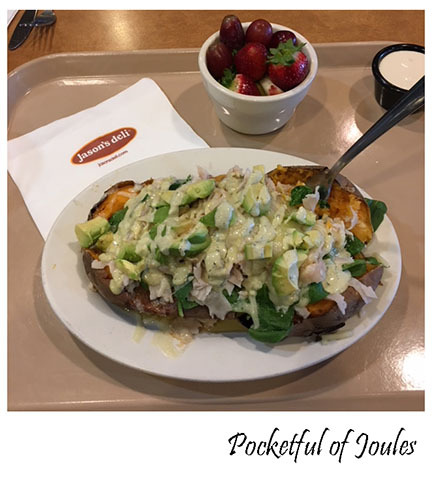 While the servings are for two people, I could usually throw an extra side item together on my own and stretch the meal for the three of us. I found Home Chef’s portions pretty comparable to Hello Fresh. However, Home Chef provided a bit larger portions for both the steak and the salmon. This worked out great for us, because Jack LOVES both steak and salmon… and polished them off! 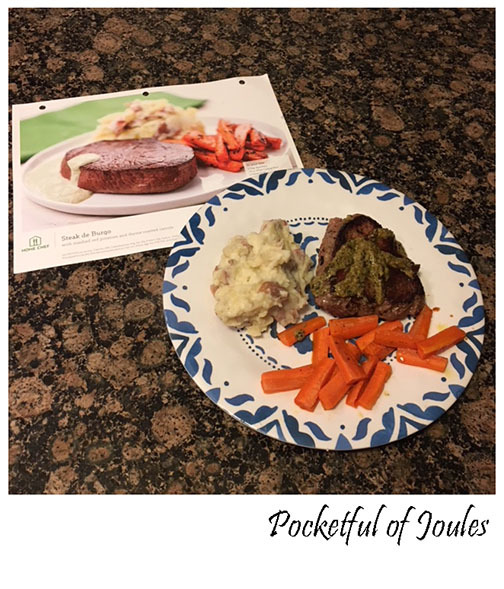 I was really pleasantly surprised by my experience with Home Chef and will continue to use them. After my next scheduled delivery of Hello Fresh, I plan on cancelling my subscription (or indefinitely pausing it) and replace them with Home Chef for my once-a-month order. I know it is much cheaper to just go and buy my own ingredients at the grocery store, and we do this the majority of the time. I just really like the opportunity to experiment with new recipes in such an easy way! If you would like to try Home Chef, you are welcome to use my special referral code: https://www.homechef.com/invite/gbd4Ves20o5rY Those who sign up using the referral invitation will receive a $30 discount off of their first order and I will earn $30 in Home Chef credit towards a future order. If you do decide to try Home Chef, please let me know what you think! A little tip though, when you sign up for your first delivery go in and immediately “pause” your second delivery date. That way you can try out a box and decide whether you want to keep the subscription before having to pay for a second box. Then, if you don’t like it just hit “cancel” and you won’t get any more boxes or be charged more than your initial payment. Have you ever used a food delivery service like Hello Fresh, Home Chef or Blue Apron? Tell me about it in the comments! With the summer ending, it is the perfect time for me to get back on track with packing lunches. Not only Jack’s, but my own! I’ve fallen out of the habit of preparing all my lunches at the beginning of the week and I need to get back to it. It’s difficult though because I’m not really a sandwich person. Sandwiches are totally ‘work lunch’ food, right? I want something where I can make three servings on Monday’s and then pack that up for my Tuesday, Wednesday and Thursday office days. Sooo… what do you eat? Are you sautéed chicken and veggies kinda person? Do you make rice bowls? Do you just give up and grab a fast food burger? Let’s talk about zucchini noodles. Or zoodles if you’re fancy. 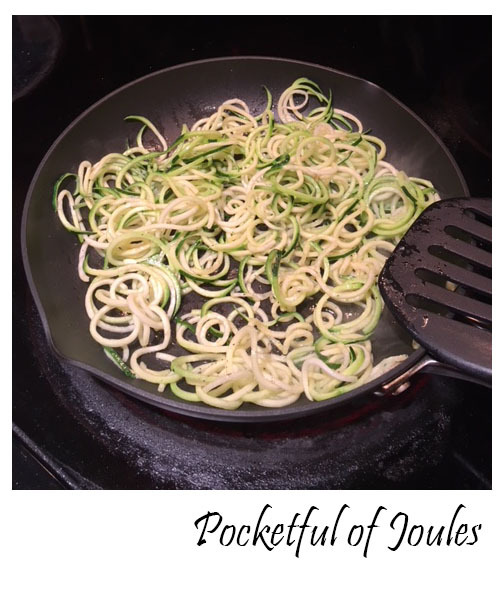 I’ve known about zoodles for a while, but they always seemed kind of time consuming. Then, I tried some at our local Noodles & Company and decided to look into exactly how time consuming they really are. If by ‘look into’ you mean, see a spiralizer at Target and just buy it with no forethought or research. 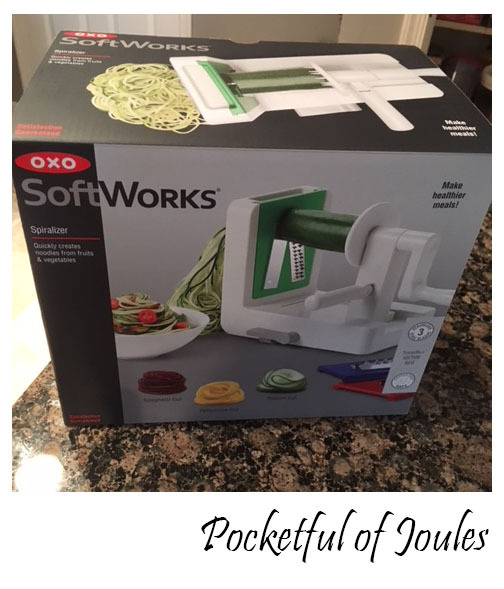 This is the exact one I bought at Target (OXO spiralizer at Target) they also have it at Amazon (OXO spiralizer on Amazon) both are listed at $40.00… which is what I paid. I also saw this one on Amazon while writing this post and it looks pretty similar for just $27.99. As I said, I did NO research… otherwise I would have gotten the cheaper one off Amazon. Anyways, I bought it on a whim and brought it home. We had some zucchini in our fridge, so I unwrapped it and used it that same night. It was SO EASY that Jack could do it! You just chop the ends off the zucchini and stick one end into the spiky part of the machine and put the other end against the blade. Then crank. And crank. And crank. 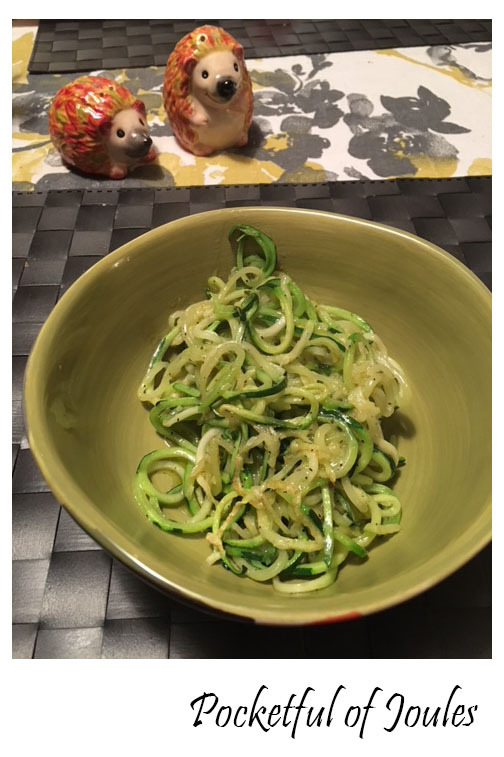 I had heard that a drawback of zoodles is that they can be kind of wet and watery. So,when I do my set up I throw a paper towel under the blade. All the zoodles collect on the paper towel and then I just roll them up and let them hang out while I’m cooking the rest of dinner. To cook them up, I just add some olive oil to the pan, throw in the zoodles and shake on some salt and pepper. 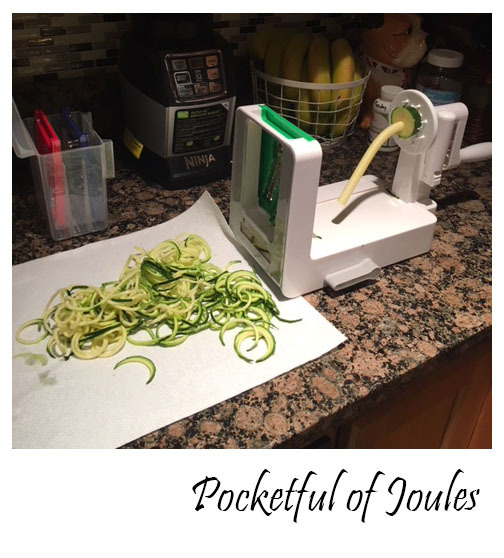 So if you’ve been thinking of trying zoodles… go for it! Now I need to branch out and start spiralizing other stuff. Do you have any favorite items to spiralize? Disclaimer: This post contains ShopStyle affiliate links and an Amazon Affiliate Program link. This means that clicking on a link may help me earn a small commission at no cost to you.